We just moved east and are currently shopping around for synagogues. We have narrowed it down to two. We feel more at home with the congregation at one of them, and the rabbi at the other. 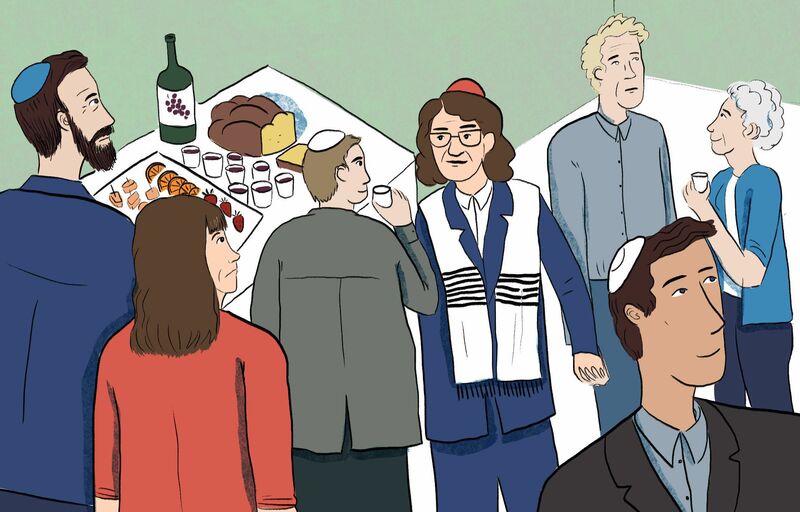 One of the issues with the rabbi we feel less at home with is the fact that she has a non-Jewish boyfriend — something we just aren’t comfortable with. Seesaw, are we old-fashioned and intolerant? Or is this a reasonable line to draw? I invite you to consider what your needs and hopes might be in belonging to a congregation, rather than focus on the personal status (gender, race, or religious identity) of a rabbi’s partner. People join synagogues for lots of different reasons. Are you primarily seeking community and friendship with other people? Do you want to get involved in committees and the life of the synagogue? Then joining the congregation where you feel most at home with other congregants makes a lot of sense. One of the pleasures of belonging to a synagogue is the feeling that it’s a home away from home, where you see people you grow to love. On the other hand, perhaps community is less important than having a close, personal relationship with the rabbi. If so, I invite you to articulate what’s important to you about the religious personal status of the rabbi’s partner. Would you feel similarly uncomfortable if the Executive Director’s partner were not Jewish? Maybe what’s salient here is the notion that ‘rabbis don’t intermarry,’ or ‘rabbis should only marry other Jews.’ It’s okay to acknowledge one’s preference directly, because it helps clarify what you value. It sounds like you value the idea of a rabbi married to another Jew. Rather than get into a debate about the threat or opportunity of intermarriage, I’ll share what I know from personal, lived experience. I am a rabbinic candidate whose partner studied Judaism formally for many years and ultimately chose not to convert. We are raising our daughter Jewishly, and joyously. What I know and see in my work every day is that the non-Jews who partner with us are our best Jewish allies. They learn about and support the Jewish identity of their partners. They often participate fully in Jewish life, sometimes with more enthusiasm and fewer hangups than their Jewish partners! Our non-Jewish allies raise Jewish children, support Jewish education, and affirm the Jewishness of their beloveds everyday. If that describes the rabbi’s partner, what’s not to love about her choice of a partner? Dr. Caryn Aviv is Associate Director of Judaism Your Way, an outreach organization based in Denver. After earning a PhD in sociology and anthropology, she has taught Jewish and Israel Studies in university settings, co-founded two Jewish start-ups, and published research on contemporary Jewish culture for scholarly and popular audiences. Last year she began rabbinical studies through ALEPH: The Alliance for Jewish Renewal.